I’ve owned these pins for so bloody long now and it’s only now I’m actually writing about them! I sorted out my office yesterday and dug out so much stuff I had forgotten about or just put to one side for another time, these included. I had bought these in December last year to put on my coats and cardigans at work, but I just never got around to it as I wanted to write about them first. As many people will know, life gets in the way, especially at Christmas time! SO I am FINALLY writing about these and after wearing the one at work today, I am so damn excited! 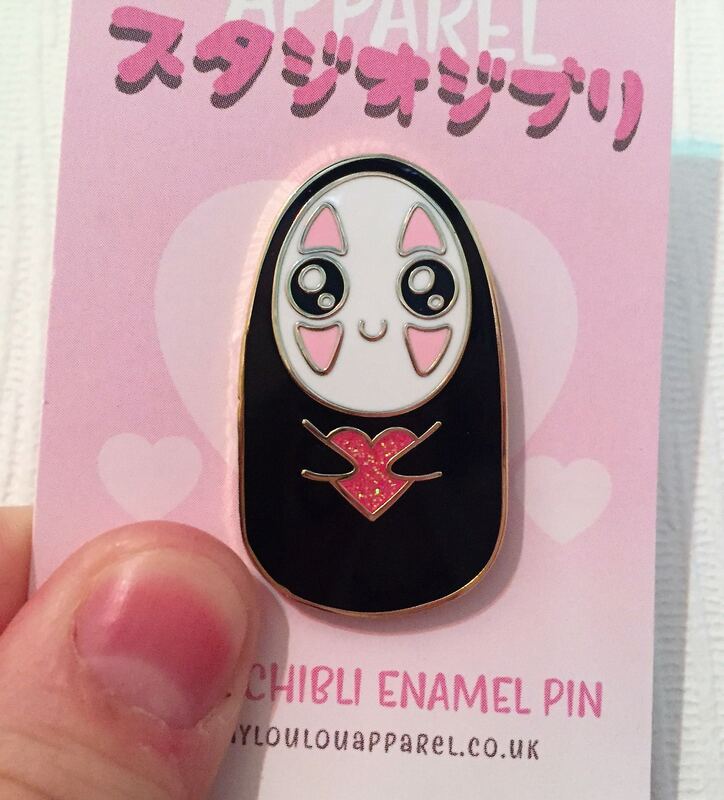 Lauren is the amazing designer behind Ayloulou Apparel and is in charge of creating cute and kawaii pieces, inspired by Sailor Moon, Disney, Pokemon, Nintendo and of course Studio Ghibli. 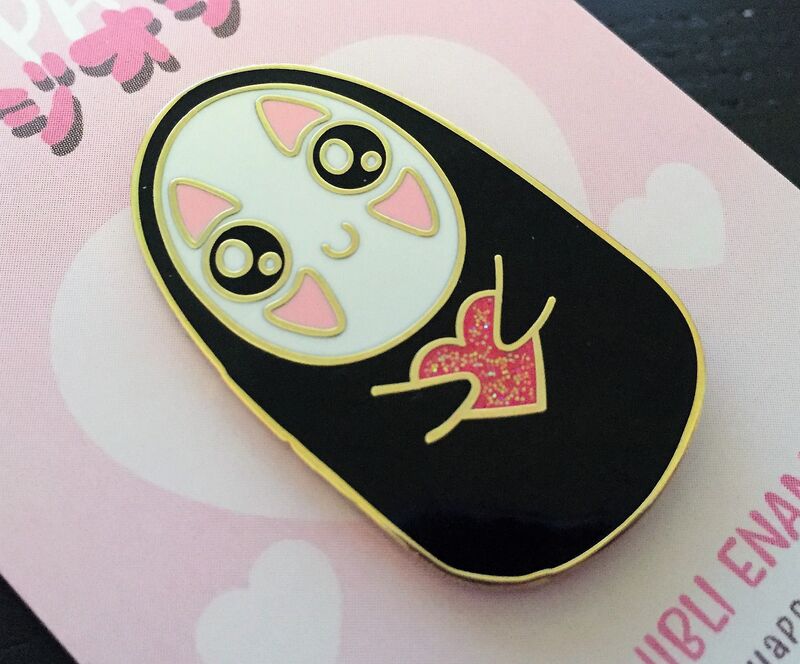 These pins are limited edition, or at least they were at the time so I made sure to pre order both Haku and No Face from Spirited Away. It’s my favourite Studio Ghibli film as well as one of my top 3 films. When these arrived I was thrilled by what I was met with. I didn’t think the quality wouldn’t be good, but oh my they really did wow me! 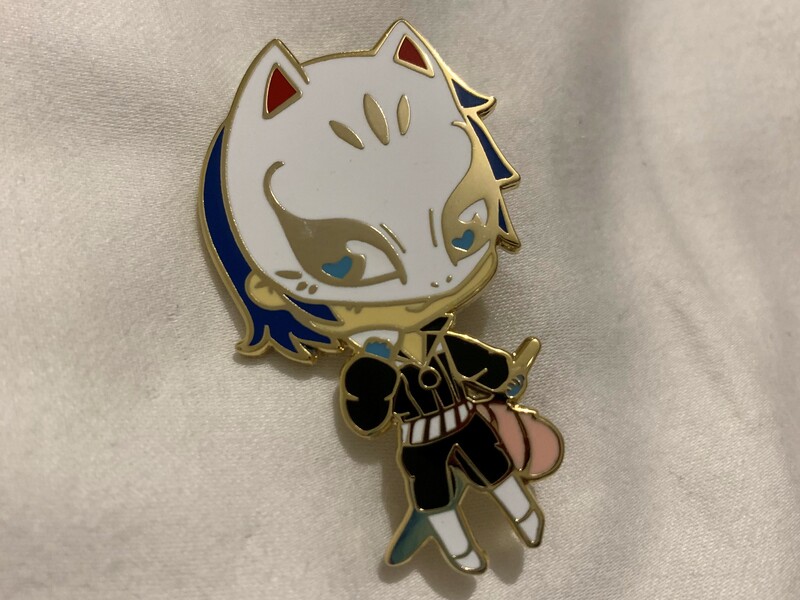 They’re an amazing thick enamel and have two pins in the back which thick hard pink plastic pin holders. In the past I’ve collected and worn pins, which have nearly been lost due to dodgy backs. 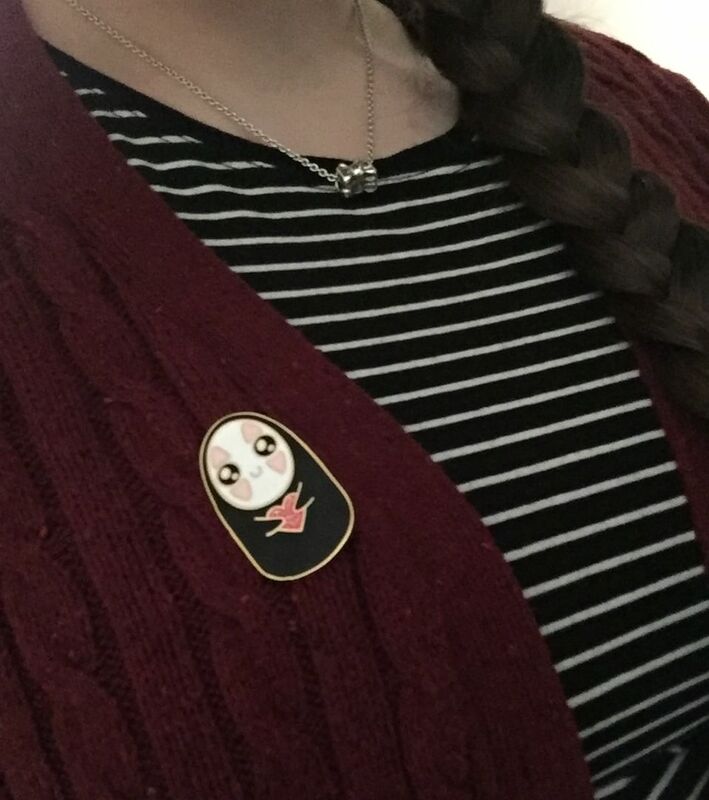 When wearing my No Face pin today at work, I felt like he wasn’t going to come undone and fall off of my cardigan. Both Haku and No Face are of high quality, with the enamel on No Face being gold and Haku being silver. 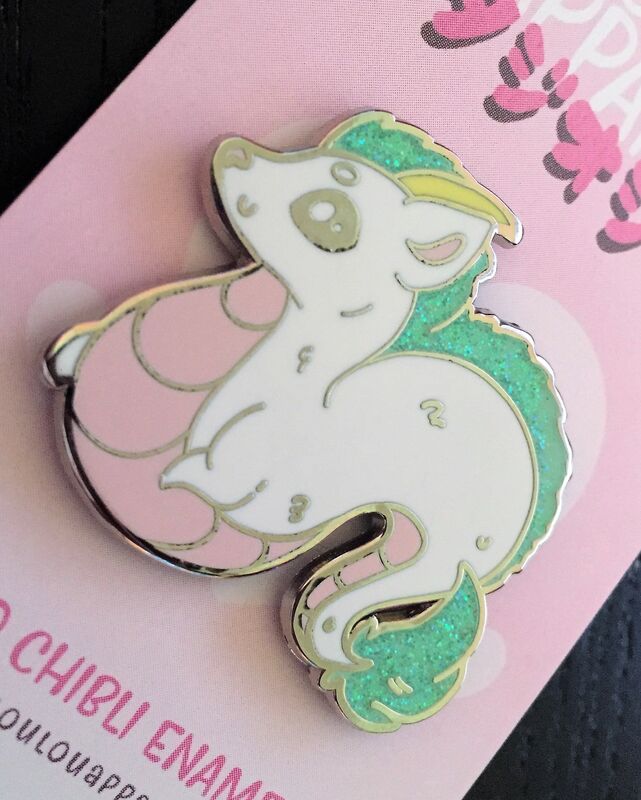 They also both have glitter on them with No Face having a pink glitter heart and Haku with his green mane being glittery too. Since then Lauren has since released another Studio Ghibli inspired piece, this being Catbus! 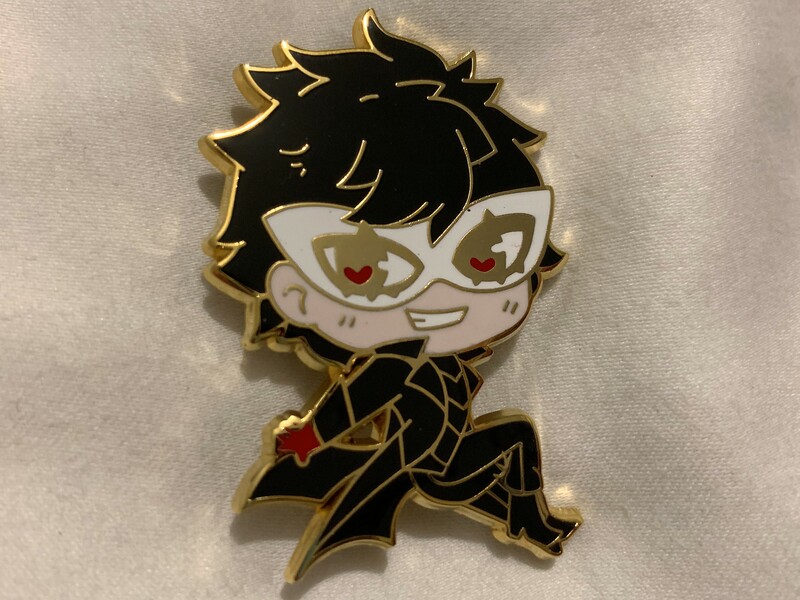 I’d love to pick him up next to wear on my yellow raincoat during the rainy spring and summer days to and from work, as well as on my weekends off. 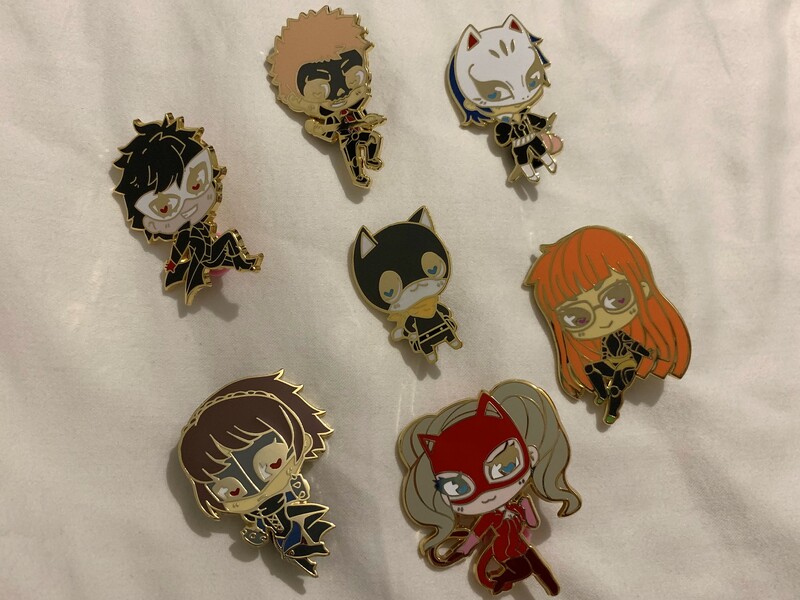 At the time I paid £7.00 each for these pins and that was definitely worth the money! That was a special pre order price, as they’re not £8.00 each. I also received some matching stickers with my pins, which I’ve stuck into my 2018 journal. You can still pick up No Face from her store here, but Haku doesn’t appear to be available anymore. 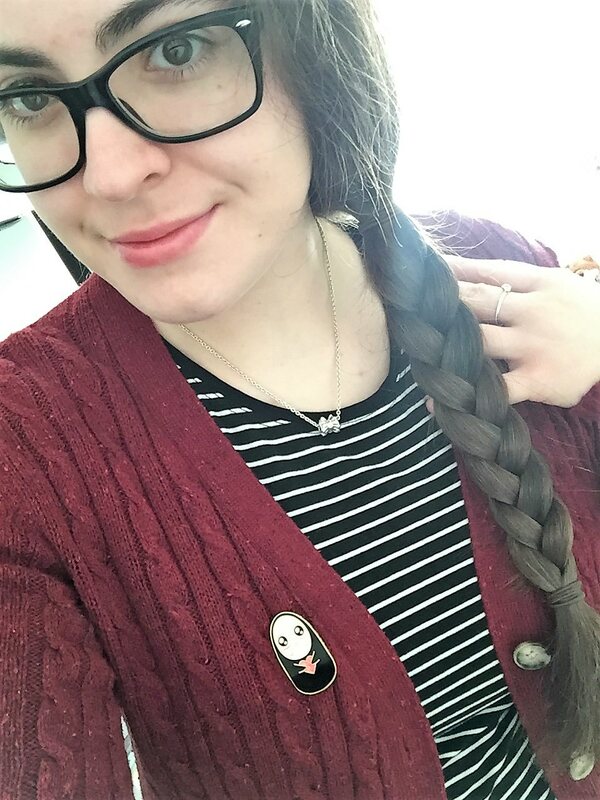 Again, I loved wearing my No Face pin today with my burgundy cardigan, but it’s my new Honey Punch rainbow cardigan (which you can read about here) that I cannot wait to pop Haku on and wear throughout the summer months! 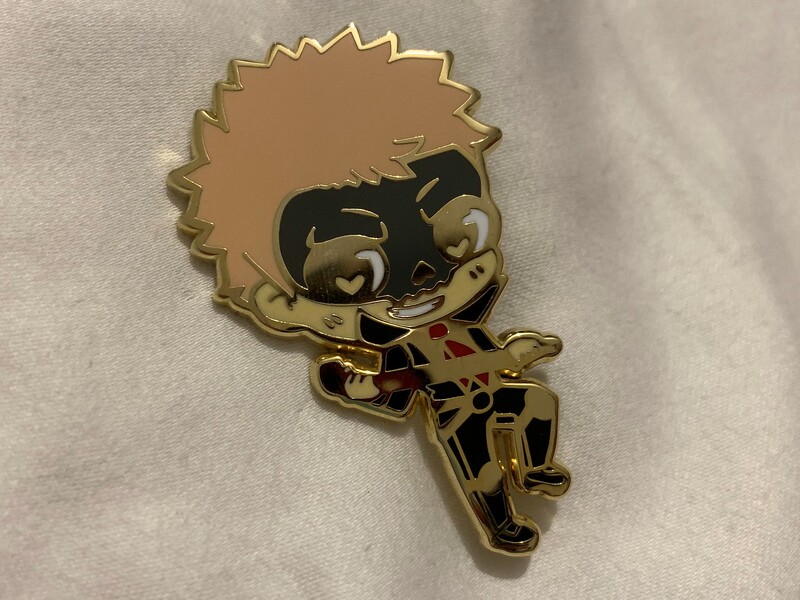 If you’re after either of these pins, or maybe even Catbus or any other designs then check out all of Lauren’s links below! 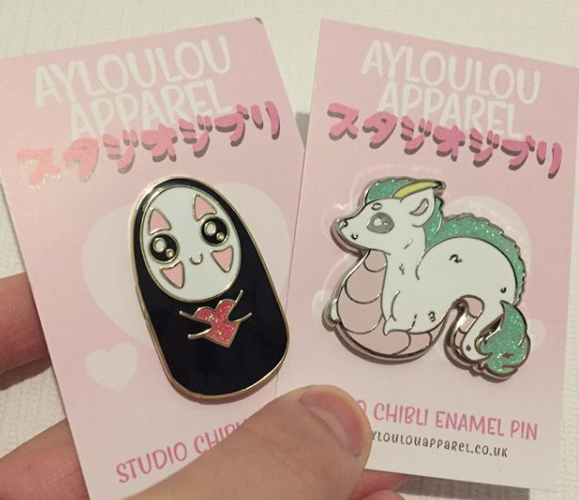 I’m sorry if these seems like such a short post today, but I just wanted to do a quick post to share my love of these pins, as well as Ayloulou Apparel! Do you love things like this? 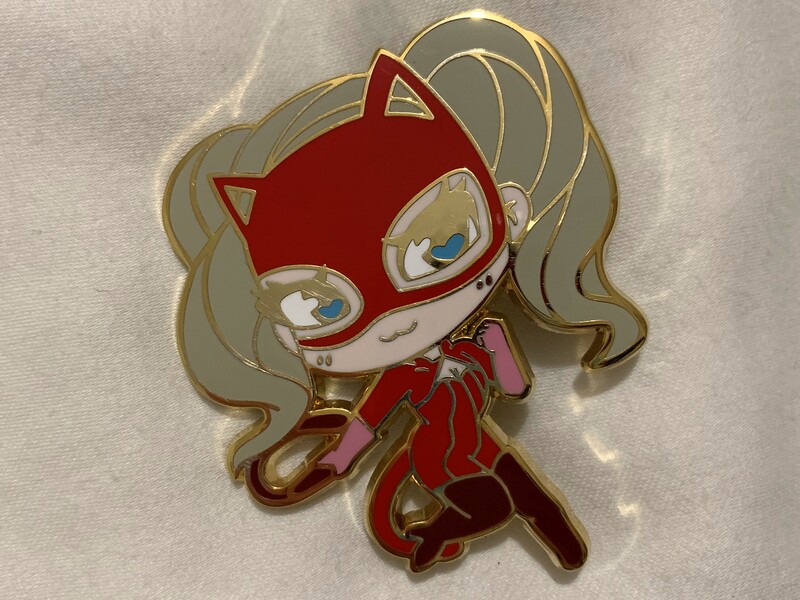 If so what pins do you own and who by? 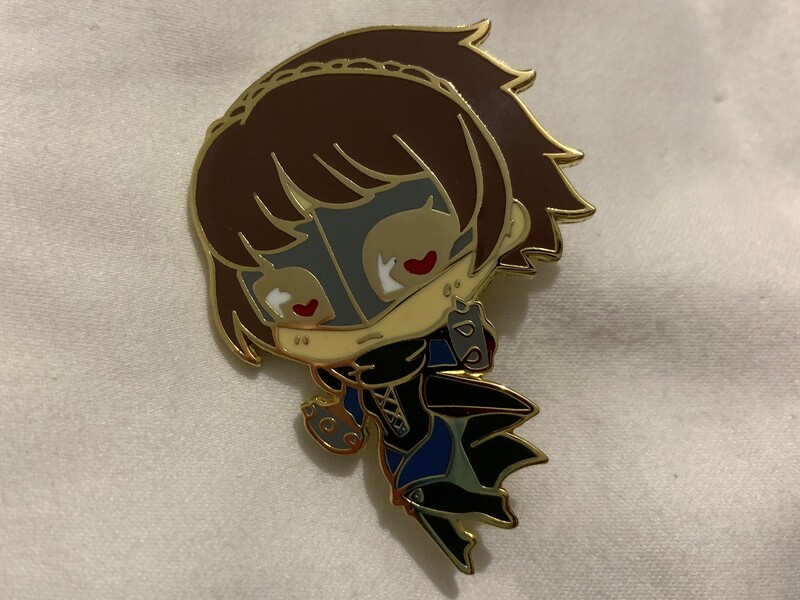 I’d love to see what pins you own. Until next time, take care all and I hope you had an amazing weekend! I haven’t written a wish list Wednesday for quite a while now, or at least I don’t recall… Actually it’s only been over a month. Jeez am I getting that old I forget so quickly? 😛 So I thought why not do one now! I seem to have grown a new love of pin badges lately and I actually don’t know why. I used to love them growing up and would collect them as and when I could, but sadly that little hobby died although I do still own all the pin badges I collected back in the day. So thanks to beauty bloggers Instagram pages I have now formed a new hobby, pin badge collecting. They’re mostly all geeky ones too and especially Pokemon themed. 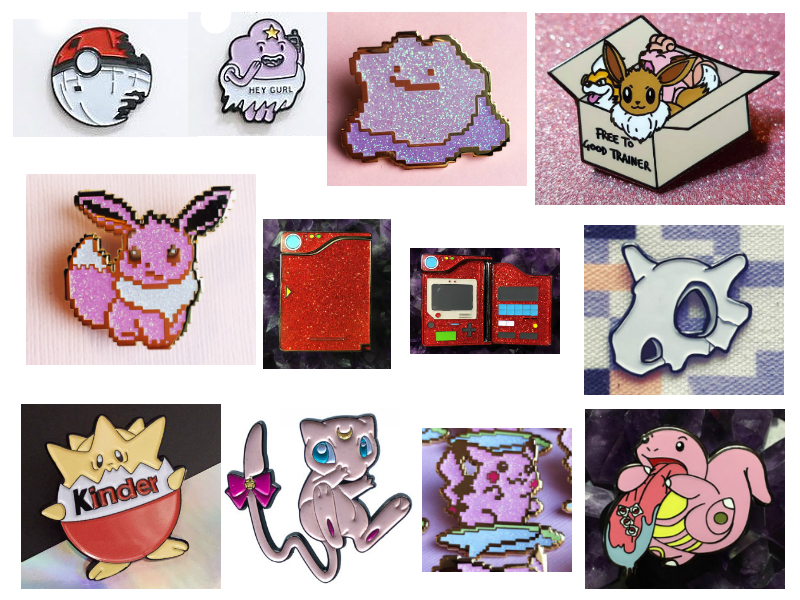 So why not make a wish list post about what pin badges I want to have in my new collection and shape my new hobby! I know I usually write about each item, on wish list posts but I really don’t feel the need to on this one. All of the pins are Pokemon related bar one which is Adventure Time. 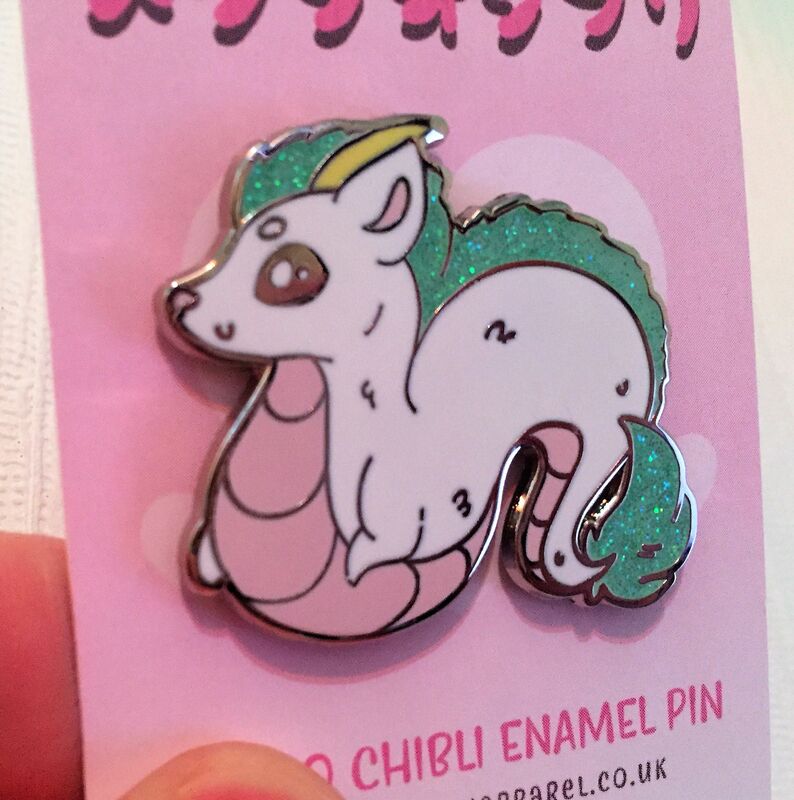 My favourite pin badge out of the bunch is the Kantodex pin by SpaceCadetCollective. It opens up and is glittery, what isn’t to love? 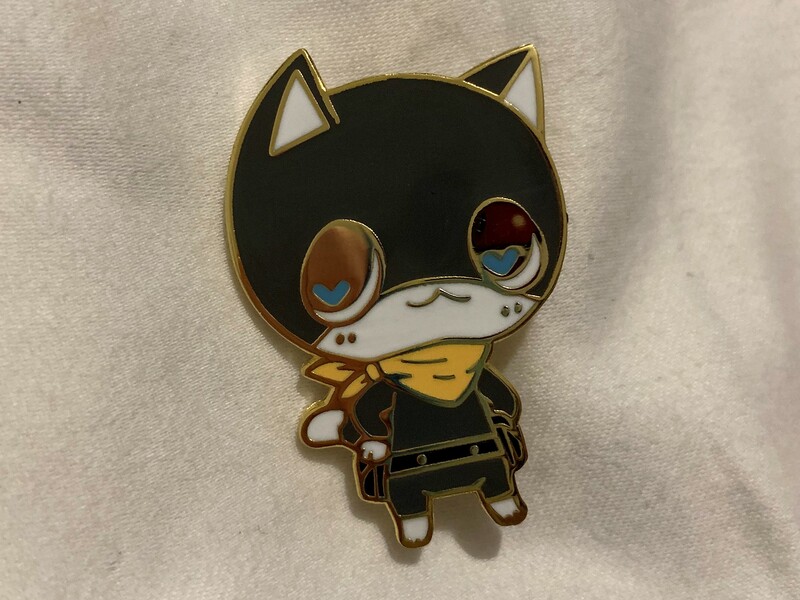 I’d stick it on my bag or on one of my jackets. 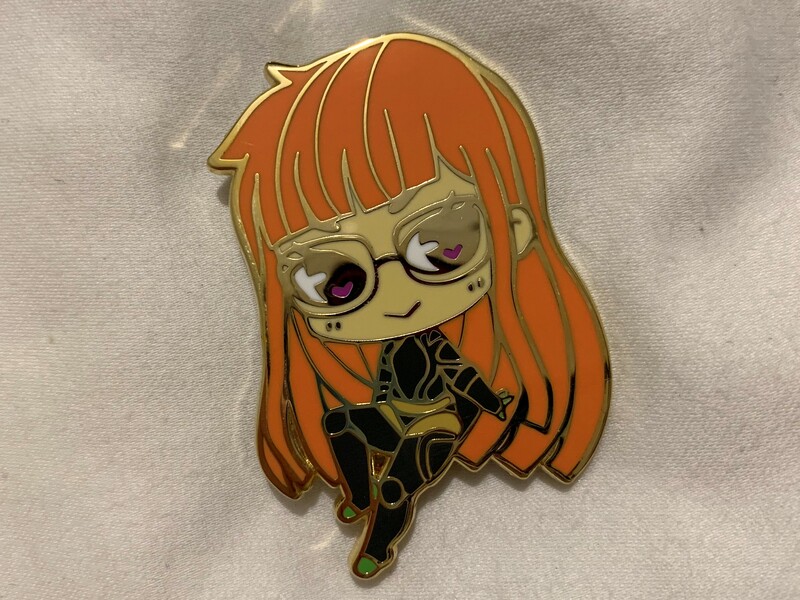 Do you like pin badges? If so which ones do you own or are lusting after? Make sure to let me know in the comments!